Works better with a data broker display like chocolate bar, bazooka, ninjapanel, stat block, titan panel, docking station, buttonbin and more, but you can also use the console command to show it. All the config is done in the core.lua file. I'll check it asap. I am currently use docking station and it seems to works fine. Uhm I have to check better because I am not able to reproduce it. Can you try to move in the bar position to see if something else is covering it ? Last edited by gmarco : 01-01-19 at 02:25 AM. Just found this addon and I like the idea, however, using Chocolate Bar and I can't get the tooltip to stay up so I can't click on any items in the list. - Move mouse up to tooltip to select something in the list but the tooltip disappears as soon as the mouse leaves the bar. 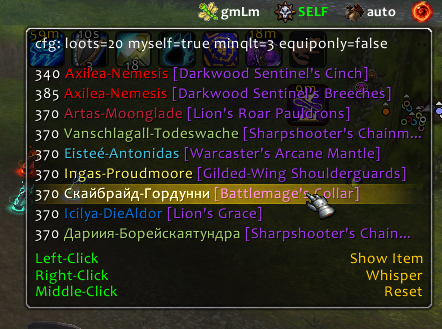 - Manually running /gmlm show and I can click on items in the tooltip fine. I installed this the same time as I installed gmAutopsy and the tooltip for it works perfectly fine with Chocolate Bar. In my other computer actually can work properly, perhaps the conflict of other addons. It seems that 7.3 can not work properly, can you update it? thank ypu! I think everything should be fine. Oh yes excuse. Just I still swing alts. Has missed the moment that there is personal Loot further. it is possible to add a roll to information? How many has thrown out everyone. Hi, sorry for the delay in answer but I miss this post. I written the addon mainly thinking to a dungeons and LFR . Are you thinking something about a ML raid ?